A spin on a traditional Caprese salad with all the flavors and textures you want on a hot summer day. It’s refreshing and a perfect balance of salty, sweet, crisp & bright. Pretty easy on the eyes too! 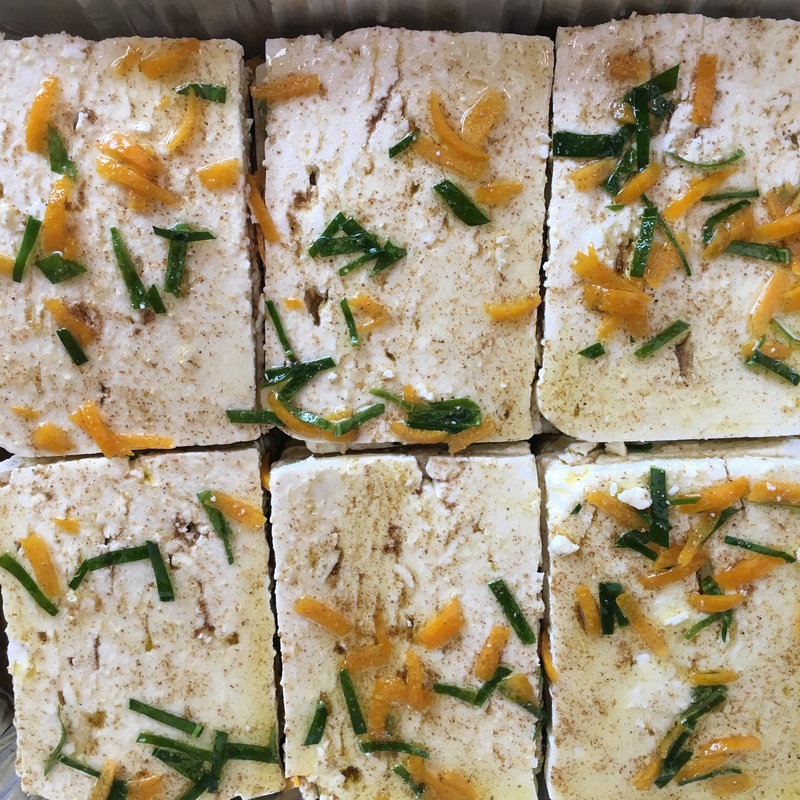 Combine olive oil, orange zest, lime zest & coriander. Let oil infuse for at least 1 hour. Cut feta into 1/4” slices. In a glass container, pour a small amount of oil mixture, add a layer of feta, top with some oil, and continue layering until all feta is covered in oil. Marinate a minimum of 12 hours but up to 7 days. Add pistachios to a blender or food processor and pulse until coarsely chopped. Remove 1/4 cup and set aside for garnish. Wash the mint leaves in cold water, shaking lightly but leaving a bit of the cold water clinging to the leaves. To the blender, add ice cube, mint leaves, 1/2 cup of olive oil and salt. Blend briefly, then add lime juice and remaining oil as needed and pulse all together. The mixture should be mostly smooth and bright green. Taste and adjust the salt, lime juice & olive oil to your liking. Spread 1/3 of the pesto on the bottom of a large platter. 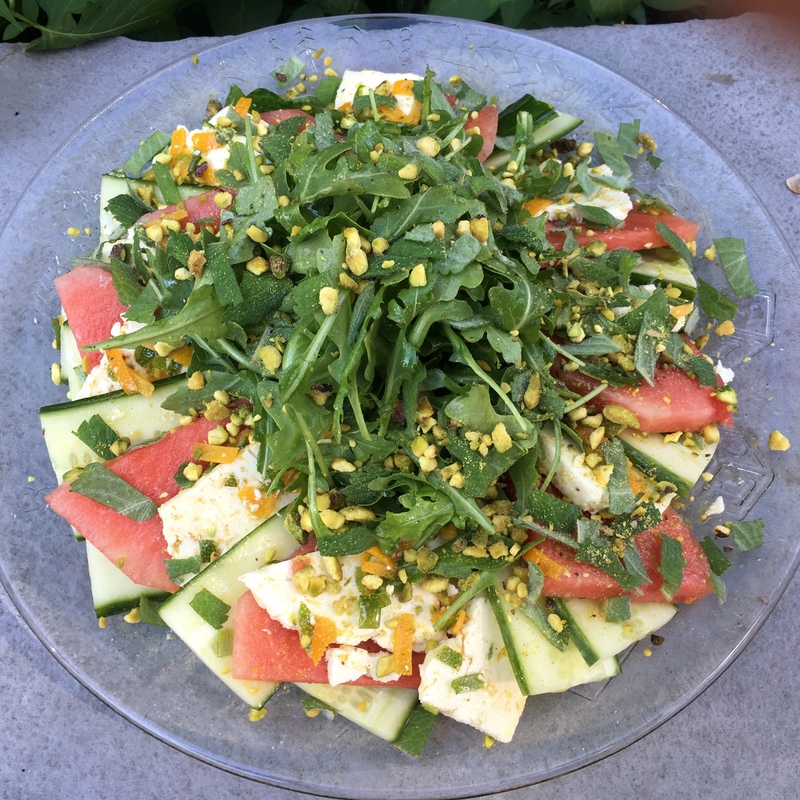 Arrange watermelon, feta & cucumber pieces, somewhat overlapping, in rows or in a concentric circle. Drizzle with additional pesto. In a bowl, toss arugula with juice from the orange, some of the oil from the marinated feta, salt & pepper to taste. Mound arugula in the center of the platter, and sprinkle with mint & reserved pistachios. Next Crab Cakes & Micro-Entrepreneurs Who Need Your Vote! !